As soon as Alexander Fleming accidentally discovered the medicinal benefit of antibiotics, bacteria began fighting back. Penicillin appeared as the kind of “magic bullet” Paul Ehrlich envisioned, but the ability of microbes to evolve resistance mechanisms has led to an evolutionary and pharmacological arms race over the last century. Antibiotics attack susceptible bacteria through specific mechanisms based on the cellular and metabolic differences between prokaryotes and eukaryotes. One class of antibiotics, the tetracyclines, prevents the synthesis of new proteins by binding to the bacterial ribosomes. Unfortunately, the bacteria responded by modifying their ribosomes and pumping the antibiotic out of the cell.1 Tigecycline, a glycycline built of the tetracycline scaffold, possesses a unique functional group that allows it to block the bacterial ribosome and simultaneously evade bacterial resistance mechanisms.2 Developed under the name GAR-936 by Wyeth Pharmaceuticals in Philadelphia, tigecycline (brand name: Tygacil) provides a new weapon in the rapidly changing battle of antibacterial resistance. As a new tetracycline, tigecycline uses the same mechanism of action of its tetracycline ancestors – preventing protein synthesis. Invading bacteria require new proteins to survive, which are made by ribosomes. A copy of the genetic information is transcribed into an RNA message that can be translated by a ribosome. During the translational process, the mRNA feeds between the two subunits presenting the codon that determines the appropriate amino acid to be added to the growing peptide chain. The transfer RNA (tRNA) with the correct anticodon enters into the A-site with the specified amino acid. From here, the amino-acyl-tRNA pivots to the P-site for the peptidyl-transfer reaction.2 After attaching, the tRNA slides to the E-site and ejects from the ribosome as a new aminoacyl-tRNA enters to continue the elongation of the peptide chain. 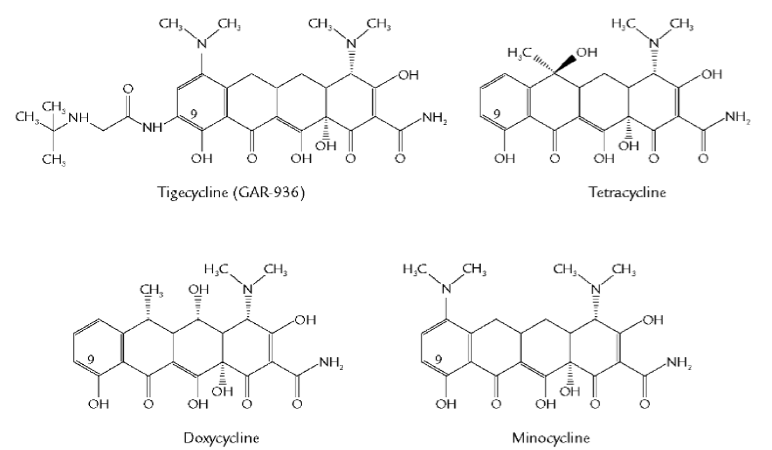 During development in the early 1990’s, tigecycline became the main focus of a new antibiotic class of glycyclines that retained the ribosome blocking mechanisms of tetracycline but avoided the evolved Tet resistance.4 Starting with tetracycline’s four-ring structure, researchers developed new generations of antibiotics by attaching various functional groups to evade efflux and avoid TetM proteins. For example, doxycycline moves a hydroxyl group from the C-ring to the B-Ring, while minocycline includes a dimethylamine to the 7-position on the D-ring. Figure 1 Structures of Tetracycline, Doxycycline, Minocycline and Tigecycline Tetracycline, the original member of the family, provides a four-ring backbone which interacts with the 30S subunit of bacterial ribosomes. The rings are identified A-D beginning with the amide-containing ring on the right side as A. Notice that tetracycline contains a methyl and hydroxyl group attached to the C-ring. Doxycycline moves the hydroxyl group from the C-ring to the B-ring, as a second-generation tetracycline. Minocycline, also a second-generation tetracycline, removes the methyl and hydroxyl from the C-ring and includes a second dimethylamin in the C-7 position of the D-ring. Tigecycline, a third-generation tetracycline or glycycline, builds on the minocycline backbone and includes the tert-butyl-glycylamido group to the C-9 position of the D-ring. The long, bulky chain in the 9th position produces the anti-resistance properties of tigecycline. Unsusceptible to the normal methods of tetracycline resistance, tigecycline continues to inhibit the 30S ribosomal subunit despite Tet efflux transporters or TetM proteins that protect the accommodation site of the ribosome. Tigecycline demonstrates the creative ability biochemistry provides to overcome bacterial resistance by building on the structure of minocycline. Tigecycline’s bulky side chain generates the improved characteristics of tigecycline. At this point, tigecycline remains the only FDA approved glycycline and offers a potent weapon against antibacterial resistance. 1. Projan S. Preclinical pharmacology of GAR-936, a novel glycycline antibacterial agent. Pharmacotherapy. 2000;20(9):219-223. 2. Seputiene V, Povilonis J, Armalyte J, Suziedelis K, Pavilonis A, Suziedeliene E. Tigecycline - how powerful is it in the fight against antibiotic-resistant bacteria? Medicina (Kaunas). 2010;46(4):240-248. 3. Doan T, Fung H, Mehta D, Riska P. Tigecycline: A glycylcyline antimicrobial agent. Clin Thera. 2006;28(8):1079-1106. 4. Peterson L. A review of tigecycline - the first glycycline. International Journal of Antimicrobial Agents. 2008;32(S4):S215-S222. 5. Garrison M, Neumiller J, Setter S. Tigecycline: An investigational glycycline antimicrobial with activity against resistant gram-positive organisms. Clin Thera. 2005;27(1):12-22. 6. Loh E, Ellis-Grosse E, Petersen P, Sum P, Projan S. Tigecycline: A case study. Expert Opin Drug Discov. 2007;2(3):403-418. 7. Olson M, Ruzin A, Feyfant E, Rush T, O'Connell J, Bradford P. Functional, biophysical, and structural bases for antibacterial activity of tigecycline. Antimicrob Agents Chemother. 2006;50(6):2156-2166. 8. Jenner L, Starosta A, Terry D, et al. Sturctural basis for potent inhibitory activity of the antibiotic tigecycline during protein synthesis. PNAS. 2013;110(10):3812-3816. 9. Tygacil [package insert]. Philadelphia, PA: Wyeth Pharmaceuticals Inc; September 2013.